Thread your needle and knot the tail end. Start by sending your needle up from the back. This should be done about 1/4" in from the edge, or at whatever length you want your stitches to be. 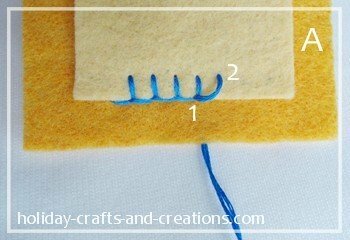 To get the stitch anchored, poke your needle up from the back again, so that the needle comes out the top at the same spot where you started, creating a loop around the edge. Send your needle under the loop stitch you just made. 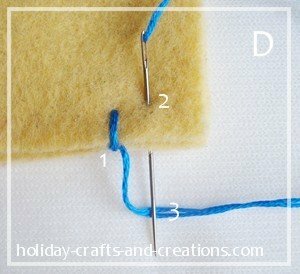 To do this, poke the needle under the stitch going sideways at the edge of the felt. This gets your thread anchored, but it is not a true first stitch. 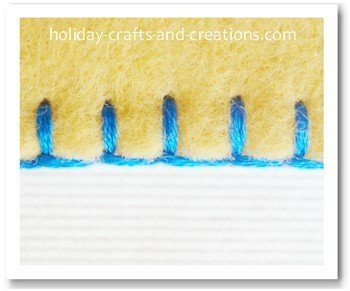 To start your first true blanket stitch, poke your needle down from the top (#2 in photo D). This should be about 1/4" over from where the thread first came up, and about 1/4" up from the edge. 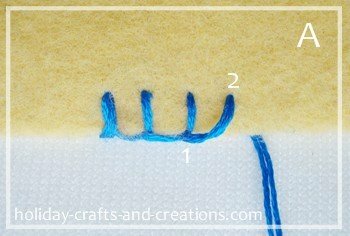 To complete your first stitch, bring your needle up from the back, and through the loop of thread (#3 in photo D). This should create a straight line down from #2 in the photo. 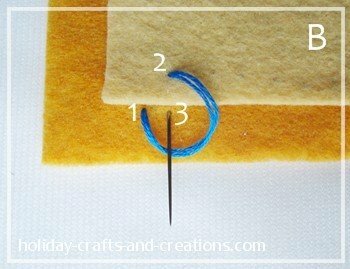 Before pulling this stitch tight, be sure that your needle is in fact through the loop of thread as shown in photo D.
Now continue each stitch like this and you are on your way! 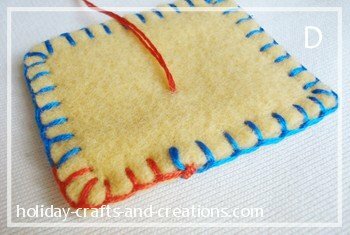 Now you know how to do blanket stitch when sewing one layer. 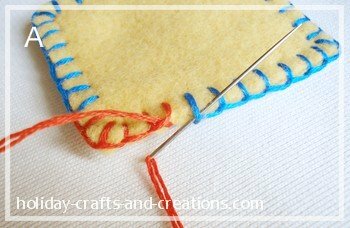 Poke the needle down as if you were starting another stitch. Pull the thread all the way through, but do not pull it tight yet. Leave enough of a loop, and only enough, so that later with your new piece of thread you can catch this loop and then pull that stitch tight into place. 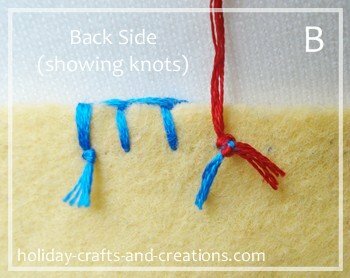 So to determine how loose to leave this last stitch before the knot, just lay the loose loop of thread across as if you had properly finished the stitch. 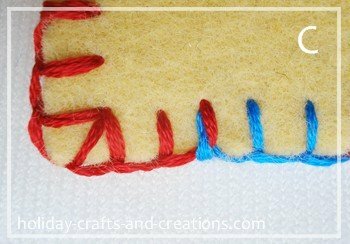 Now thread a needle onto the new piece of thread, and then tie the tail of the new piece of thread to the tail of the old piece of thread, as close to the back of the felt as possible, so that the loose stitch of thread stays the length you want it (red thread represents new piece). Then trim the tails off the knot. 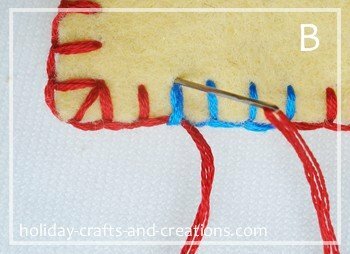 To complete the stitch that you have left loose, slide your needle underneath the loose stitch you left, and pull your stitch tight into place. This photo shows that your thread has been changed and you are on your way again. 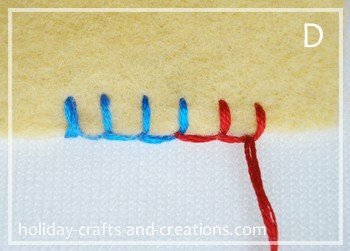 To connect your last stitch to your first stitch, slide your needle sideways underneath your first stitch, and pull your thread tight. 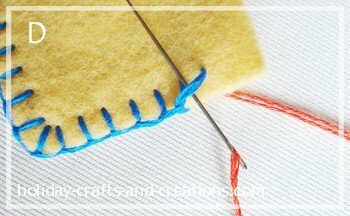 Now poke your needle down at the top of the first stitch you made. 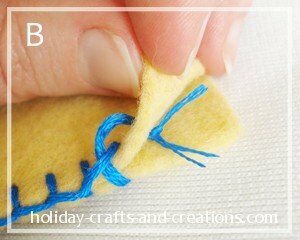 Pull this stitch down tight, and then knot your thread off on the underside of the felt, and your stitch is complete. Thread your needle and knot the tail end. Start between the two layers and poke your needle down through the bottom layer. This will put your knot in between the two layers. This should be done about 1/4" in from the edge, or at whatever length you want your stitches to be. 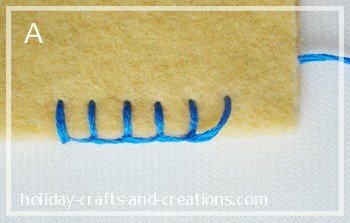 To get the stitch anchored, poke your needle down from the top layer so that the needle comes out the bottom at the same spot where you started, basically making a loop. Send your needle under the loop stitch you just made. 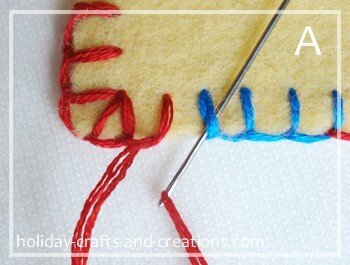 To do this, poke the needle under the stitch going sideways along the crack of the two layers. This gets your thread anchored, but it is not a true first stitch. 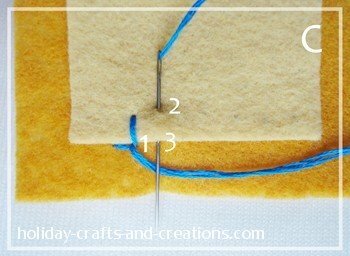 To start your first true blanket stitch, poke your needle down from the top (#2 in photo D). This should be about 1/4" over from where the thread first came up, and about 1/4" up from the edge. 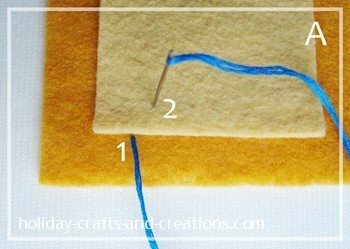 To complete your first stitch, bring your needle up from the back, and through the loop of thread (#3 in photo D). This should create a straight line down from # 2 in the photo. 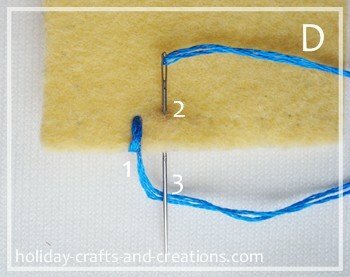 Before pulling this stitch tight, be sure that your needle is in fact through the loop of thread, as shown in photos D and E.
This photo shows several stitches, and how the loop should be underneath with the thread coming out over the top. Now continue each stitch like this and you are on your way. 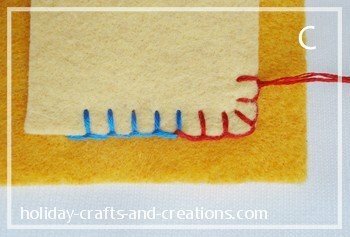 Now you know how to do blanket stitch when sewing two layers together. 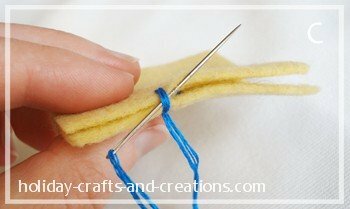 Poke the needle down as if you were starting another stitch, but only go through the top layer. Pull the thread all the way through, but do not pull it tight yet. Leave enough of a loop, and only enough, so that later with your new piece of thread you can catch this loop and then pull that stitch tight into place. 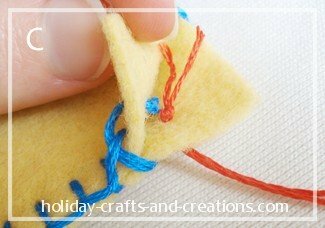 So to determine how loose to leave this last stitch before the knot, just lay the loose loop of thread across as if you had properly finished the stitch. 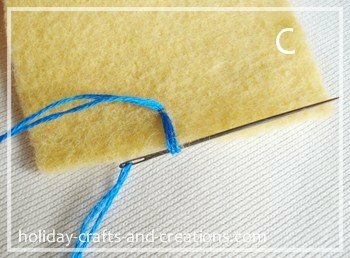 Cut your thread and knot it off with the knot tight against the felt so your loose loop of thread stays the length you want it. Now thread your needle and knot the tail end. Just like when you started, poke your needle down and out the bottom layer a 1/4" up from the edge. 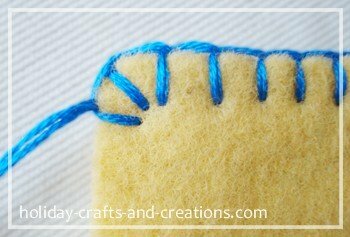 To complete this stitch, slide your needle under the loose loop you left and then pull your stitch tight into place. 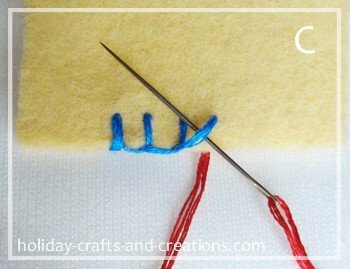 Now loop your needle through that stitch again, but before pulling it tight, send your needle through the loop to make a knot. Then pull it tight to complete the knot. 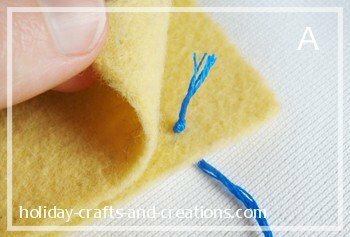 To hide the knot and the tail ends, send your needle between the layers of felt about an inch, and then out through one side. Pull the thread tight, as shown in this photo. Then cut the tail off as close to the felt as possible. The tail should then disappear between the layers. Thread your needle and knot the tail end. Start by sending your needle up from the back (#1 in photo A) at the bottom edge of the piece you’ll be sewing down. Start your first stitch by poking the needle down to the back (#2 in photo A) about 1/4" away from where the thread first came up and about 1/4" up from the edge. 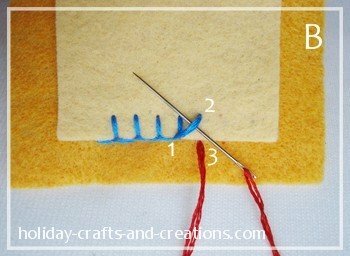 To complete your first stitch, poke your needle from the back to the front (#3 in photo B). This should be straight down from #2 in the photo. It should also be right at the bottom edge of the piece you are sewing down. 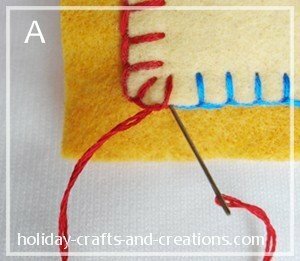 Before pulling this stitch tight, send your needle through the loop of thread, or as photos B and C show, make sure your thread stays under your needle. This photo shows you making the second stitch. #1 on this photo was #3 on photo B. Continue each stitch like this and you are on your way. 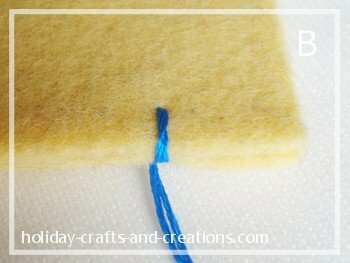 Now you know how to do blanket stitch when sewing in from the edge. 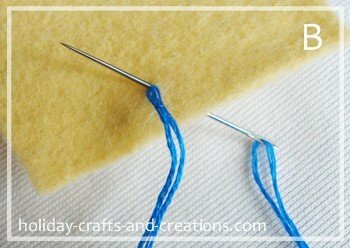 Poke the needle down as if you were starting another stitch. Pull the thread all the way through, but don't pull it tight yet. Leave enough of a loop, and only enough, so that later with your new piece of thread you can catch this loop and then pull that stitch tight into place. 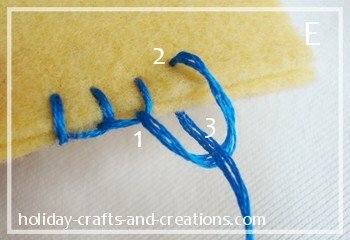 So to determine how loose to leave this last stitch before the knot, just lay the loose loop of thread across as if you had properly finished the stitch. 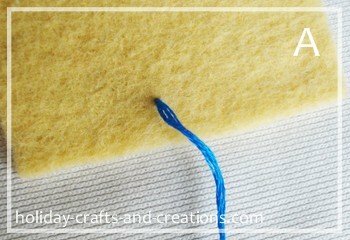 Cut your thread and knot it off with the knot tight against the felt so your loose loop of thread stays the length you want it. Now thread your needle and knot the tail end. Now just like when you started your project, poke your needle up from the back (#3 in photo B) at the bottom edge. 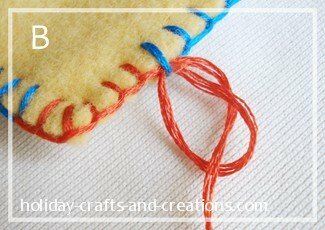 To complete this stitch, slide your needle under the loose loop you left and then pull your stitch tight into place. 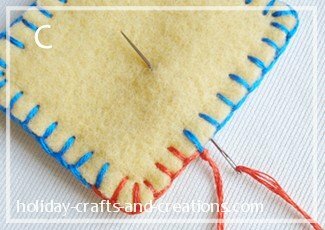 Poke your needle down to the back, on the right side of your last stitch. Then knot off your thread. Doing corners is pretty easy. To go around a corner, just poke your needle down diagonally across from the corner. These three stitches could all meet in the same hole in the felt, or they don't need to (as we have shown). It is just personal preference.